Incredible Lot of Calacatta Gold 2″ Hexagon Honed for $16.95 a Square Foot and Free Shipping for 2016 (or until we run out). We seem to have finally hit the sweet spot in the quarry where it is producing just the right amount of veining and a really, really white based product. This is incredible grade of Calacatta Gold very pleased I know many companies would see this and raise the price. We’ll keep the price the same and let our customers benefit from this product in the same way we are just as happy to receive it ourselves. This is all part of our Calacatta Gold collection with trims included here. Use the Calacatta 1×1″ Hexagon honed or polished $17.95 a Square Foot and Free Shipping (thru March 2016) and then a classic 3×6″ Ceramic on the wall which we have for $2.95SF and Free Shipping. I love the simplicity, you can really go with honed or polished on the floor, it is the grout that provides the traction (or friction coefficient if we want to use the real name) not the stone, big misconception. Go with what you want. Calacatta Gold 2″ Hexagon Honed Mosaic Tile $15.95 a Square Foot available online from The Builder Depot. Our products are always well above average excellent I would say, but occasionally you open a crate and it is just extraordinary there is no rhyme or reason, it perhaps was a quarter of a block, some left over field tiles from a million dollar casino project who knows how. All I know is that I love to open the crates. Then just occasionally you see this. There are selfish reasons, I have to do my own bathrooms so I am always on the lookout for the exceptional. But this really is incredible Calacatta. It will sell fast. If you would like to buy this particular lot you will have to mention the reference number in the comments of your online order. Reference it: ‘Calacatta 1×1″ Hexagon Lot# 03052014’ (not very creative name but it will get you product from this lot). There is 360 sheets to a crate. My guess is this will be all gone by May 20th. So if you are reading this in June, I apologize. Above is a more recent picture this is taken on Friday Sept 9th 2016. The quality if anything has improved just slightly we have got the base even whiter. 2016 really has been a comeback year for Calacatta Gold. 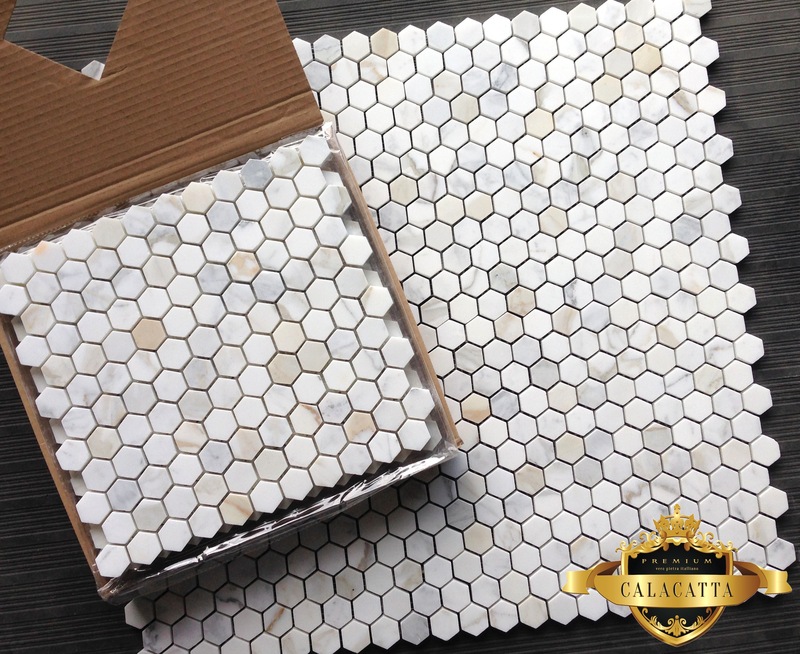 Our Calacatta 2″ Hexagon honed marble mosaic tile arrived on the 11th of March 2014. As it arrived I opened the crate opened a box and took a picture with my iPhone. Nothing too artistic. Packed in individual shrink wrapped packages, this Calacatta is superb. Given the quality of the stone it is clearly understandable why we shrink wrap each mosaic, taking the extra step to ensure this product arrives to our customers in the best possible condition is vital. Otherwise is would be an absolute waste 😦 (a waste of perfect stone like this would be awful). If you are reading this post on March the 31st, then it has almost certainly all shipped by now. We do however have another shipment arriving very soon. It is the same grade as we do not accept anything less. You can even see the 3×6″ on the left hand side of the pallet, it is the same block and equally exceptional. We will have a container of Calacatta honed arriving every month. This is the plan. I do not think we can get anymore at this quality level. People are used to seeing Carrara in retailers. The common view of Carrara is gray with gray veining. The reality is if you have offices in Europe (like us) you can actually get some far lighter shades of marble stone. In this image above we are showing the 1″ Hexagon Calacatta with the 3×6″ Honed Venato. Anyone looking for a Calacatta bathroom but doesn’t quite have the budget for Calacatta 3×6″ Subway Tiles ($16.95SF) the Carrara Venato Collection in a 3×6″ format is a great substitute for only $7.00SF. The whiter base of the Venato blends nicely with the Hexagon. The Venato will not have the Calacatta gold veining, but it will look good on the walls and due to it’s white base offer a good option or substitute, when budgets or availability are an issue.